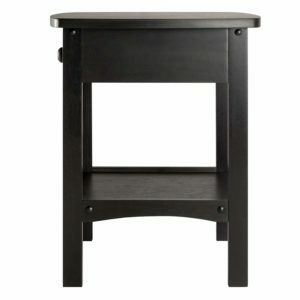 Winsome Wood 20218 Claire Accent Table, Black is now available at Amazon.com for just $36.13 (REG $67.49) (As of 13 February 2019, 17:03 PST – Details) with $31.36 (46%) Savings. 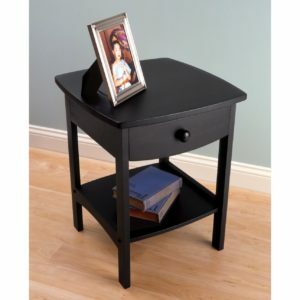 Classic, clean-lined end table/night stand offers casual style. Crafted of composite wood; wood nailhead accents. Simple carved rails complement roomy storage drawer and open shelf. Some assembly required; measures 18 inches in diameter by 22 inches high. 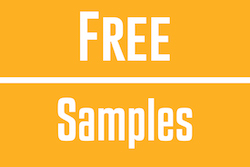 Available in Natural, Walnut, Black, or White. 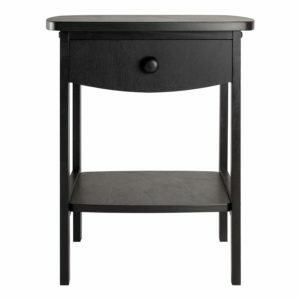 Elegantly simple, the Claire Accent Table has room for all the necessary nighttime accessories. Its curved, smooth design blends well with any style of bedroom decor. -Overall dims 18″W x 18″D x 22″H. -Inside drawer dims 12.05″W x 13.78″D x 2.32″H. 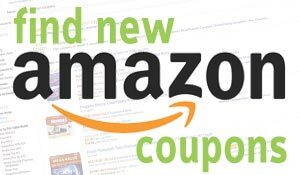 -Shelf dims 13.31″W x 14.88″D. 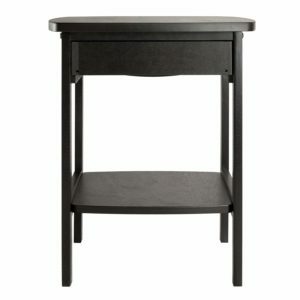 -Clearance from drawer to shelf 9.33″. 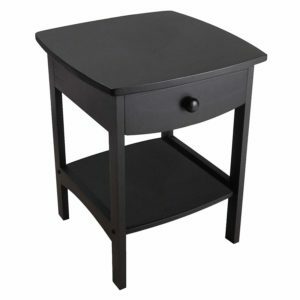 Combining solid/composite wood construction with a tidy and practical style, this versatile end table/night stand makes a fresh and clean addition to the room. The oversized tabletop features a straight-edged square shape, while below the four rectangular legs host a deep storage drawer and open shelf. For subtle flair, the drawer front and lower side rails are sculpted with a wide curve that softens the table’s overall look. Also notice how the wood nailhead accents and a simple drawer pull offer a tailored finish. Classic enough to stay in style no matter how the furnishings around it change, this table comes in four handsome finishes: Natural, Walnut, Black, and White. It measures 18 inches in diameter by 22 inches high. Insider drawer dimension is 12”W x 13.78”D x 2.32”H. Shelf is 13.31”W x 14.88”D. Clearance from bottom of drawer to shelf is 9.33”. –Kara Karll.